Founded in 1919 our club is believed to be the oldest active chess club in Glasgow. The club’s name is derived from its original meeting place, the John Anderson Royal Polytechnic Warehouse at 93-99 Argyle Street. 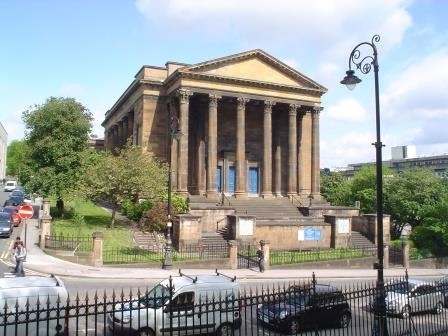 We meet at the Wellington Church Hall, at the corner of University Avenue and Southpark Avenue, in the West End of Glasgow, G12 8LE. We hold our meetings on Thursdays throughout the chess season which is from late September until late April. Competitive play is usually from 19:30 until 22:00. We hold our meetings on Thursdays throughout the chess season which is from late September until late April. Competitive play is usually from 19:30 until 22:0). We meet at the Wellington Church Hall, at the corner of University Avenue and Southpark Avenue, in the West End of Glasgow. As always, we extend a warm welcome to new members. Our activities cater for chess players of all skill levels from novice to grand master. You are welcome to attend up to three times before you decide to become a member. All members are entitled to compete in the Polytechnic Championship. We run several teams in the Glasgow Chess League and the Dumbarton & District Chess Association league. All members will be able to find a team that suits their playing ability. We play in the Richardson Cup. We were runners-up 2017-18 and winners in 2016-17. We organise two open Quickplay tournaments each season ( in September and April). In November we organise a special event such as a demonstration or simultaneous display. About Us: This page gives you information about the club, such as membership subscriptions. Location: Find out where we meet, and how to travel to our chess club. Calendar: You will find a list of all the chess club events throughout the season. Blog: Keep up-to-date with the latest news, events and results. Contacts: Contact information for our office-holders and team captains. Contact Us: Send a message to Dairena our chess club secretary or Andy our webmaster. History: Discover the history of our club and our achievements. Club Championship: The rules of our club championship and a list of recent champions can be found here.